Two of my new music theatre projects will have their world premiere in 2016. I began developing the first project, Staring at the bin, at the Sounds and City Spaces Festival in Verona. Staring at the bin is a large scale music theatre work situated on the city streets. It is constructed from many smaller performances that emulate life found in these places. Sounds and actions from public places form the basis of the compositions. More information about Staring at the bin will appear shortly on this website, including videos shot in Berlin featuring the Ensemble DieOrdnungDerDinge and myself. 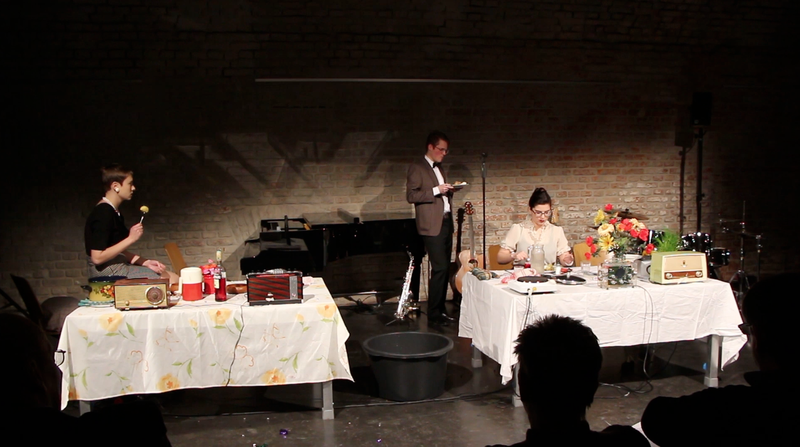 The second project was developed by the Music Theatre Collective – Music for Chameleons, which was formed by Anja Füsti, Isabelle Kranabetter, Anna-Sophie Mahler, Pascal Martin, Johannnes Öllinger, Meriel Price, Damian Rebgetz and Cathy van Eck in 2013. As a starting point we took the appearance of John Cage in the game show I’ve got a Secret. More information about this project and the collective Music for Chameleons will follow shortly.